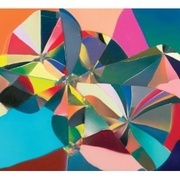 Glasser's debut album _Ring is a beguiling collection of songs that are by turn haunting and brutally upfront. Produced with help from Van Rivers and the Subliminal Kid - the team behind Fever Ray and the latest Blonde Redhead album - and Foreign Born's Ariel Rechtshaid, Ring is a made from an alloy of mix of electronic beats and acoustic percussion, layered textures and lush, complex arrangements. The variety of sounds presented here is impressively far-ranging: bells, glockenspiels, accordions, brass, strings and all manner of other strange instruments giving the album the feel of a whistle-stop tour of climes far more exotic than Cameron's L.A. base. In fact, much of the record's first half feels like a virtual Far-Eastern odyssey, from the savage tribal drumming that opens 'Apply' to 'Home''s sweeping orchestral climax. That's not to mention the chiming piano and plucked strings that accompany the meditational avant-jazz of 'Glad'. The later stages of the album reveal more of the electronic influence, although it's displayed subtly. Even the dubstep lurch of the closing 'Clamour' sounds like it was played by a drunken New Orleans funeral procession rather than a programmed computer. It's Mesirow's voice, though, that dominates. Expressive and crystal clear, she sings about love and nature and strange monsters. It actually takes a couple of spins to realize that the polyphonic washes of noise at the root of these songs aren't synthetic at all, rather a choir of Cameron-clones swooping and sighing in the background. Some might argue that there's an elephant in the room, though, one that looks suspiciously like a diminutive Icelandic woman. As was the case with White Hinterland's overlooked Kairos, there's an obvious debt to Bjork here. Yet is it not the case that female artists with a certain aesthetic and sensibility are always doomed to such comparisons? And as far as criticisms go, that particular comparison is like complaining that someone is too talented, their music too beautiful, and the fact that Mesirow sounds as fully-formed and assured on her own debut as Bjork did on hers suggests that 2010's brightest new star will only shine ever more in the years to come.